Flash, bang, what a picture. On Friday afternoon an old friend posted on my Facebook wall a link to an article about a new supernova discovered on Thursday in one of the arms of the Whirlpool galaxy (M51) and wondered if I’d seen it. 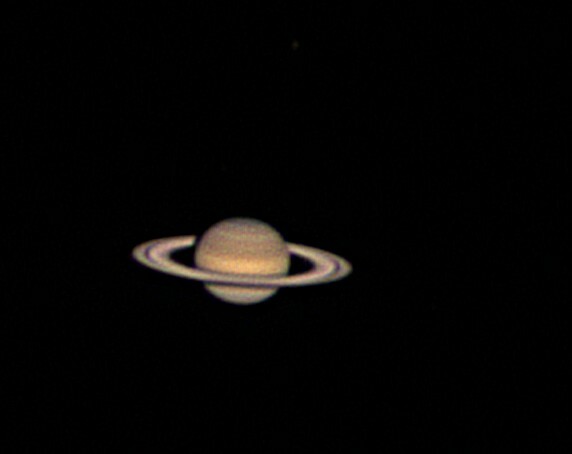 Fortuitously, Friday evening was practically the clearest sky I’ve seen in Oxford so after Saturn became eclipsed by the house roof (which now happens annoyingly early) I decided to have a go at imaging it. 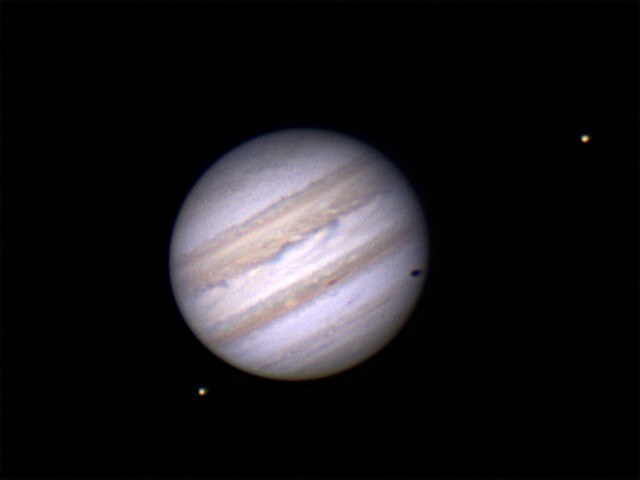 After I having to re-aligned the telescope, as the LX90 mount doesn’t seem to take care of accumulated pointing errors very well and was hence pointing in the wrong part of the sky, I managed to get on target. 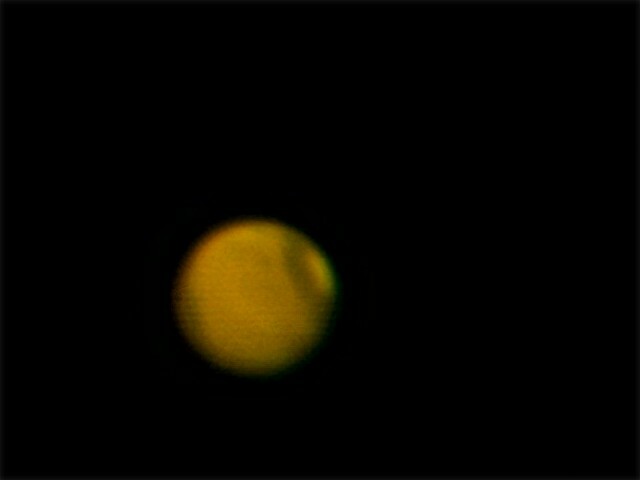 I swapped the eye-piece for the camera, found a nearby bright star to get focus and then moved back onto the subject. 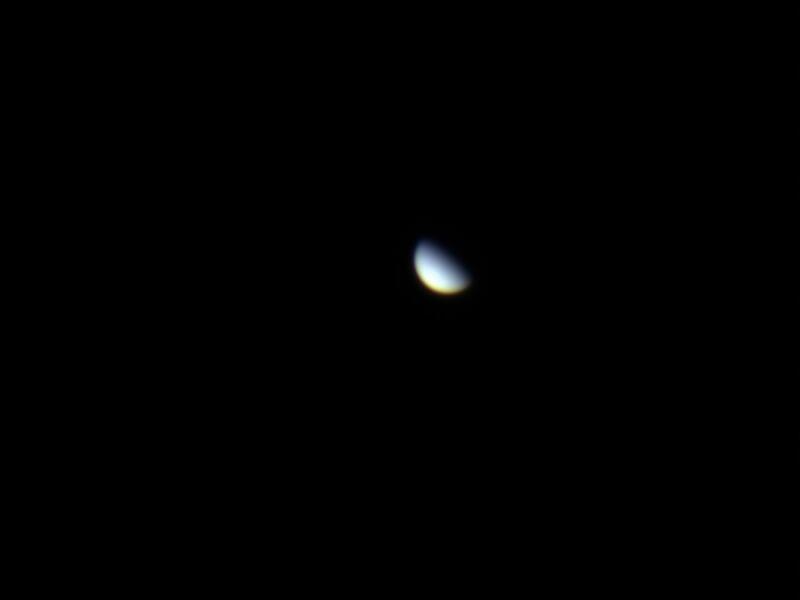 I tried a couple of exposures, all taken using an infra-red remote control so as not to cause the ‘scope to bounce around, but only one of these was usable. The trouble is that the LX90’s mount isn’t that good at tracking the sky either, even with an equatorial wedge. It seems to jerk forward randomly every minute or so making exposures longer than about a minute practically pointless. 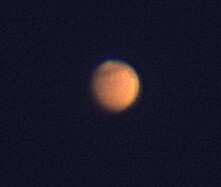 Still, with the level of light pollution, even a minute’s exposure creates a mostly orange image. As can be seen, the galaxy itself is quite a subtle feature, mostly obscured by the reflected glow of the Oxford light pollution. So, the next task was to try to filter this out and enhance the galaxy within the image. I did this by adjusting the colour curves for each of the three colours and then adjusting the overall curve. As you can now see, the light pollution has been greatly subdued and the galaxy stands out far greater. You can still see an artefact caused by the optics of the telescope, the subtle ring of orange with a bright dot in the centre, but this can’t easily be removed. Not quite as good as you’d get from a professional set up but adequate to show the supernova. 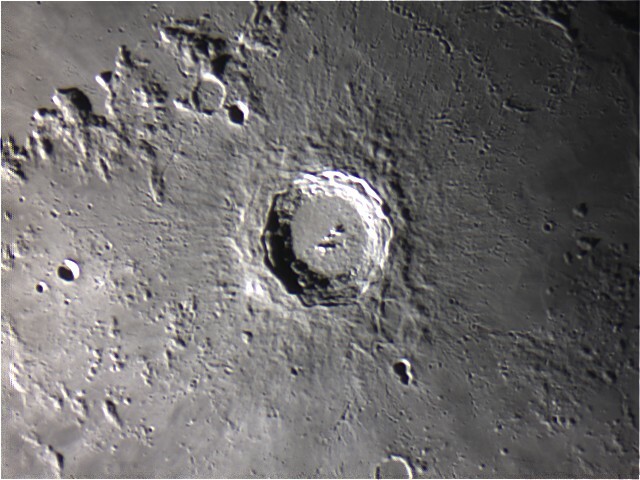 Quite soon after the purchase of my telescope last August I determined that the time and effort it took to deploy the ‘scope and set it up meant that most clear evenings weren’t going to be able to be utilised. Almost as soon as I’d got it all ready it was time to pack things away again, or the clouds had rolled in. I needed a fixed observatory which would allow me to start observing quickly. After doing research on the ‘net, in early October I finally plumped for a 6ft x 6ft rolling roof shed from Alexander’s Observatories and sent an e-mail asking for a quotation. At the same time I did the same for the patio base foundation from a local landscape gardening firm, N.V.Firmin. Little did I know how long both of these stages of the project would take. In fact, I imagined that there could be a possibility of having it functional by Christmas. Well, at least the landscape gardening firm got back to me quickly. However, after getting the quote I was a little disappointed to learn that the start date for the works would be after Christmas sometime. Still, having not heard anything from the observatory company I wasn’t too worried about the delay. Time ticked ever onward and October became November and November became December. Finally, over two months after my initial contact, I got a reply from the observatory company. To be honest I was expecting never to hear anything at all at this point and was starting to look at alternatives. Still, the quote was good so I gave the go-ahead and sent the deposit, which was cashed on Christmas Eve. Everything went quiet for a few weeks and it wasn’t until the end of January that I heard from the landscape gardening company. Typically they wanted to install my patio and fencing the weekend I was away down in Cornwall for my and my Dad’s birthday. (Don’t you love the way life works that way?). Anyway, they started work the day before I left so I was able to survey their markings on the lawn after I got home (in the dark) and made amendments. For good measure I drew a sketch plan and taped it to the inside of my patio doors. I was very glad to discover after my return that everything was in order and a very nice job had been made. Another month passed and I was about to send another e-mail when out of the blue the template appeared. It was now 10 weeks after I’d paid my deposit and was getting a little concerned that I hadn’t heard anything more. A couple of weeks later I sent off another e-mail and was surprised to get a reply back within three days informing me that work on my build would be starting in a couple of weeks and the delay was caused by a number of large observatories in the queue before mine. This, I assumed, meant that the timer for the delivery of my unit would then start, i.e. it would be 8-12 weeks from that point. I was not that happy. You an imagine then the pleasant surprise I got when just a couple of weeks later I received a text message asking if it was OK to deliver the shed the following Thursday. Of course I said yes! So, after months the day of the observatory arrived… 7th April, 2011. Nick duly arrived at 8:30am, not long after his ETA and surprising seeing as he had driven directly from Norfolk, and he started right away… with the help of the first coffee of the day. Due the relatively small size of the observatory Nick was able to prefabricate most of the parts and carry them all complete in his van, so in came the base and quickly the chipboard floor panels went down, cutting a hole for the pedestal. 8:47am: Base complete, pedestal hole cut. It didn’t then take very long until the walls came in one at a time, they were lined with single ply and the observatory started to take shape. 9:48am: The walls are up. Nick at this point was on his third mug of coffee, along with biscuits. It’s thirsty work, especially when it’s the hottest day of the year so far and the area’s a bit of a Sun trap. The next part of the build was to install the supports for the roof rails and the rails themselves. Basically, the supports are just 75mm fence posts. The horizontals slot into recesses in the walls and are supported by other posts at the most distal end from the shed. 11:18am: The roof rail supports are being fitted. Once these were complete and the aluminium tracks installed it was time to install the roof. The main wood lattice structure was delivered as a single unit. Onto this was screwed the part of the southern side of the shed which slides with it before, finally, the wheels were installed. The whole thing was then lifted by the both of us onto the shed. 12:15pm: The roof structure is on. The roof was now fitted with chipboard sheets which were then covered with roofing felt before more shuttering was installed at the gable ends. The project was starting to look almost complete. More coffee helped… And most importantly, the roof rolled. 2:05pm: The roof rolls for the first time. From this point on things slowed down a little as it was all about installing the final details such as the door, the roof locks. Once these were done it was time to bolt down the pedestal. 3:10pm: The pedestal is installed. Build complete. And so, by half-past three the installation job was complete and Nick was on his way back to Norfolk. 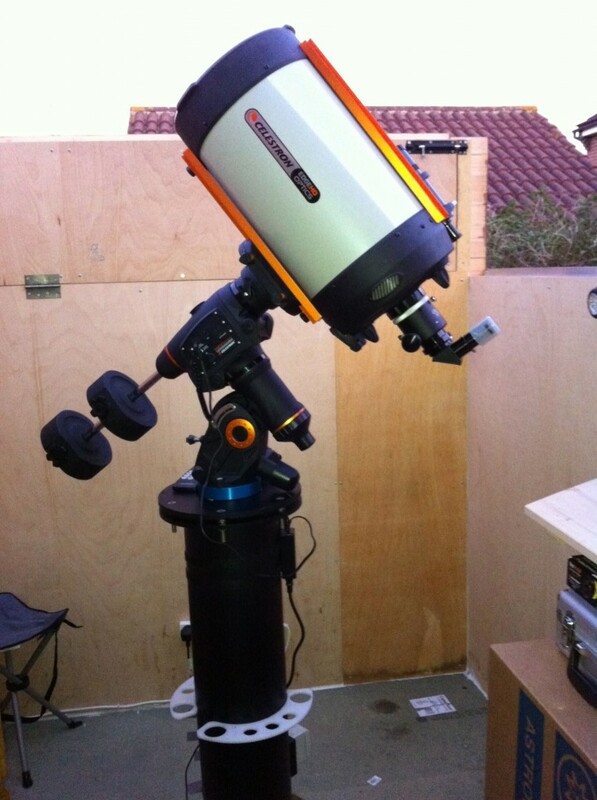 I spent the rest of the afternoon and evening setting up my telescope for the first time in its new home. I had to rotate the pedestal by one bolt hole so that it was closer to being aligned north-south and then level its top. Although the basic structure was now complete there was still no power in there and most importantly the strut which joined the two rail supports together was rather inconveniently at nose height. This would be rather tricky to navigate in the dark so I needed to raise it above head height. Also, I wasn’t happy with having the chipboard floor exposed to the weather and so I decided to clad the base with some wood cladding. Another inconvenient problem was that the eastern folding panel was too close to the ‘scope and hence couldn’t be folded down. All these problems were fixed the following weekend. I used a sledgehammer and a block of wood to ease the whole observatory 5cm away from the house, relieving the folding panel problem before re-engineering the strut and bolting the legs down. The Weekend: The finished product, well almost. And so it’s finished… well almost. I’ve still got to paint the inside and then there’s the proper final alignment of the ‘scope mount but it’s mostly there. I certainly didn’t expect last October that the whole project would take six months to complete. But does it meet my requirements? It would be a bit sad if it didn’t. Well, let’s say that I can now go from deciding to go out to do observation to getting the first object in the eye piece in a little over four minutes and it takes a similar amount of time to close things down again. So, yes. A definite improvement on the 40 minutes it took previously. 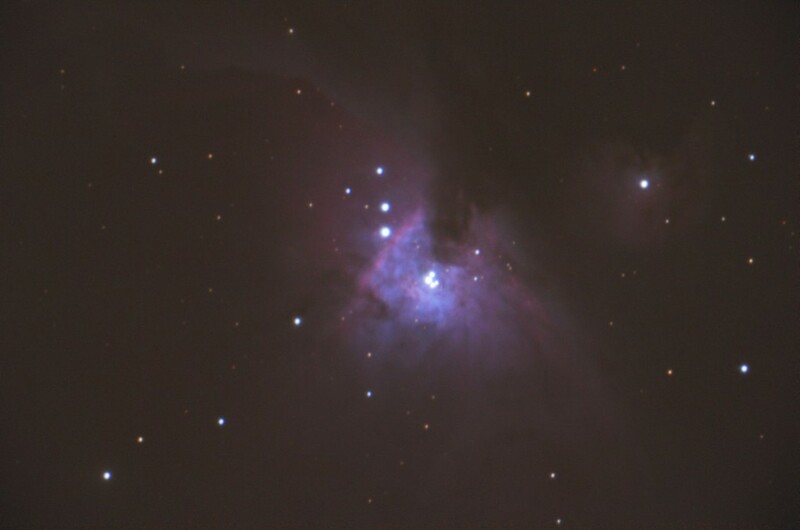 As mentioned in a previous post, I’m recently bought a new telescope with the thought of using it for astrophotography. Now, seeing as the last part of the order turned up a little over a week ago, the equatorial wedge, I’m finally in a position to start on the project in earnest. To this end I went out shopping on Saturday for a camera and a machine to drive the camera and the ‘scope. Unfortunately, because it is about to be replaced it is becoming scarcer, which meant that I could only find it as part of a kit with a lens I don’t actually need. Oh well. On the control machine front, I picked up a netbook. The twin-core, 1.6GHz Atom processor powered Acer Aspire-One 533 should be ample for the task. There’s not a great deal of processing power required to control the camera, acquire the images or run Stellarium or similar to drive the ‘scope. I just need to get a serial cable now. Anyway, Saturday evening was a beautiful evening with crystal clear skies, which gave me a good opportunity to have a first experiment. As you can see, this 60 second exposure really shows up the problem with light pollution in the area I live. I’m going to have to look into getting a light pollution filter. I’m definitely going to have to look into ways of getting a sharper focus. Not all of the fuzziness is caused by atmospheric disturbance. 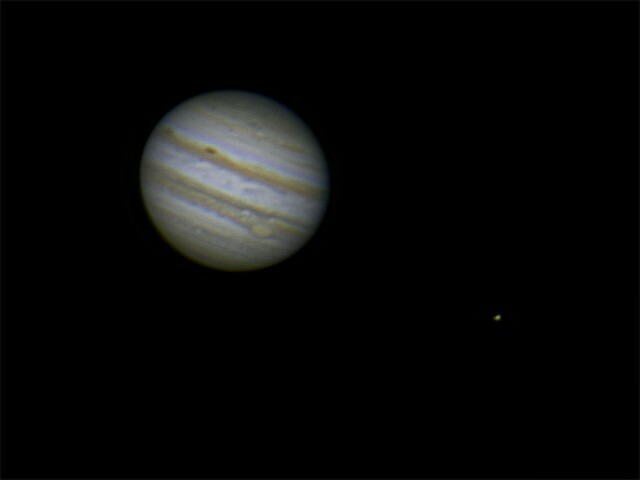 Anyway, following on from my photographic exploits I noticed one of the Jovian moons, Io, coming out from behind the planet. It’s amazing but you can actually see it move relative to the planet with the gap visibly changing in only seconds. It must be moving at quite a speed. A tale of two telescopes. I’ve just taken delivery of a new Meade 8″ LX90-SC telescope and tonight had the first chance to take it for a spin, as it were. This is despite the British weather trying its best to get in the way. 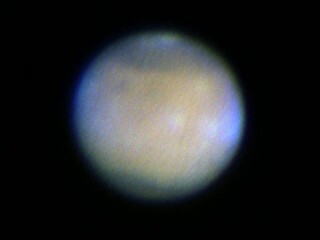 Still, the breaks in the cloud were big enough for me to align the ‘scope. I have been surprised by the contrast between this ‘scope and the one I bought for my Dad the Christmas before last, however. That ‘scope seemed to be a Friday afternoon job. It arrived with the wrong type of Autostar controller and the battery boxes weren’t (and still aren’t) connected properly. Also, it was far harder to get it to align properly and never seemed to do so accurately enough. 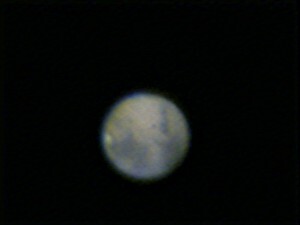 His ‘scope is a 10″ Meade LX90-ACF (i.e. has the more expensive optics). 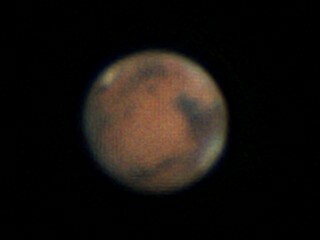 My new ‘scope, on the other hand, seems far better put together. Other than a slightly bent bolt on the tripod, which is used to hold the ‘scope on the tripod, everything is in good working order. Not only this but the alignment process actually works and works well. I think this is partly helped by the replacement of a electronic compass and level (which never seemed to work) with a good, old-fashioned compass with a bubble. Just to show how good the alignment and calibration was, I set the ‘scope to point at Jupiter about 10 minutes before it rose above the roof of a near-by house. (It also happened to be in cloud as well, but that’s beside the point.) When it did appear it was right in the centre of the field of view. I didn’t need to tweak it at all. This never was possible with my Dad’s ‘scope. Also, the image was a great deal better than with my Dad’s ‘scope, and the magnification seemed higher (with the same type of eye-piece), even though they’re supposed to have the same focal length. This was very unexpected as the ‘scope is smaller and has the cheaper optics. Am I happy? Yes. Other than the minor problem with the bolt, which makes it slightly more difficult to set the kit up and dismantle it again, it’s actually better than I expected.